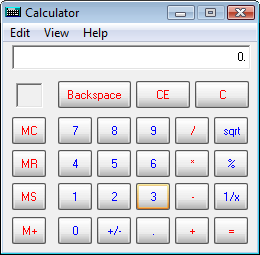 Hide all your personal data in this freeware awesome calculator.You might wonder that i have got mad,how one can hide their data in calculator.But friends,keep one thing in mind,programming is the way of designing,program things in such a way so no one could ever doubt on you. 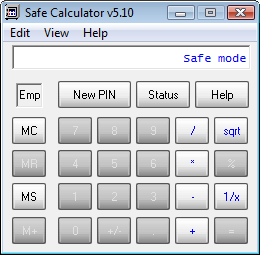 Safe calculator,as the name suggest,its a calculator which have a safe and is used to store and hide personal files. Safe calculator GUI has been designed in such a way that it looks like a default calculator and infact it can perform calculations like default calculator. Download safe calculator from below download button. To protect files using safe calculator,first enter in safe mode then press "+" and then "=" in calculator,a new small window will open,browse through it and select the file you want to store and then hit "store" option.The file will be stored in safe calculator and a message will appear "File stored:File_name.extension with Date". To restore the file, from safe,just click on "-" key,a small window will open,select the file you want to restore and click on "=" key in calculator and file will be restored from safe.To change password,click on "New PIN",enter the pin you want to set and click "=" and then "MS",your password,will change. Hope you guys like this software which can be used by anyone to perform calculation but no one will doubt on you that you have hide some files in it.